The classic Rouge Pur Couture lipstick colours by Yves Saint Laurent Beauté in a collector case. The outer casing and the lipstick bullet of Rouge Pur Couture Dazzling Lights Edition are engraved with a sparkling celebration of fireworks both eye-catching and free-spirited. Rouge Pur Couture is a rich and pigmented formula, in one stroke luxurious colour dresses the lips. 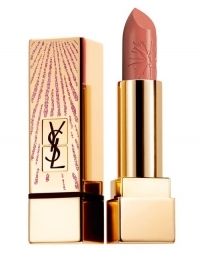 Apply Rouge Pur Couture in the centre of the lips and then blend towards the contour.